Leave it to Chris Matthews, a former speechwriter to Jimmy Carter, to actually commemorate the 30th anniversary of the former president's infamous "malaise" speech. 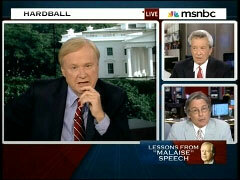 On Wednesday's "Hardball," Matthews invited on his former bosses from the Carter White House, former speechwriter and now New Yorker senior editor Hendrick Hertzberg and former aide Gerald Rafshoon to mark the event and claim that Carter was vindicated by history as Matthews proudly asserted Carter was "Dead on," about "putting on a sweater, lowering the thermostat," to solve the energy crisis. And Hertzberg did Matthews one better by proclaiming Carter a "prophet." CHRIS MATTHEWS: Rick it seems to me Carter was dead on, on the need for energy sufficiency and dealing with the energy conservation. Putting on a sweater, lowering the thermostat. All of those things made sense. He was right about the problem of nuclear proliferation. Of arms getting to countries like Iran. He's way ahead of his time on that. And also his concern for human rights. Right? So he was right, but? HENDRIK HERTZBERG, NEW YORKER, FORMER CARTER SPEECHWRITER: Well he was, he was in this particular speech, especially, which was really unlike anything that he had ever said, it was unlike anything any president had ever said. In this particular speech he was sort of a prophet. He spoke as a prophet. And, and I mean by that, not as someone who is predicting the future but as someone who is diagnosing, diagnosing the national soul. This was something that an awful lot of people in the White House, Vice President Mondale foremost among them, did not want him to do. I was one of those who thought it was, that it stood a chance of really breaking through to the American public. And I still think it might have....But, but that spiritual crisis, that, that Carter diagnosed he was right about that and the result was not that we faced up to it but that we retreated into years and years of fantasy and of phony optimism and, and notion that we could just consume and consume and consume. Later on in the segment Matthews turned to the transition from George W. Bush to Barack Obama as he determined: "It took Bush to make us see the importance of an Obama...Rick what do you think about Obama coming in after, a sophisticated Obama coming in after a different kind of, an incurious president like Bush?" This led Hertzberg to liken Obama to Carter which, at least in his mind, was a compliment to the current President as he declared: "Yeah I think there's no question that it really required the comprehensive disaster on every level, really of the Bush administration, to make Americans ready to take this extraordinary and wonderful leap of faith that they took in electing this remarkable president that we have now. I mean I don't make a lot of comparisons between Obama and Carter. I think they're so different temperamentally, politically, in a lot of ways but one thing they do have in common, I think is they both believe in speaking to the American people as if they were adults. And that's something that the eight years of Bush made us hungry for." HERTZBERG: -we proved unable to solve it. Although what Gerry says is absolutely right in terms of the concrete realities of energy. But, but that spiritual crisis, that, that Carter diagnosed he was right about that and the result was not that we faced up to it but that we retreated into years and years of fantasy and of phony optimism and, and notion that we could just consume and consume and consume. MATTHEWS: Yeah I think the big car and the big gas guzzlers was not the solution to the energy crisis. Let's take a look now at a transition that makes a lot more sense to a lot of us, to a lot of us here. That's President Bush 43 leading to President Obama. You might say he begat Obama. It took Bush to make us see the importance of an Obama. Let's watch. GERALD RAFSHOON, FORMER PRESIDENTIAL AIDE: Well every new president is the antithesis of the failed president that either he defeated or his party defeated. And it took a Jimmy Carter to come in after Nixon and Watergate and the, and the scandals of the CIA and the Vietnam War and people looked outside of Washington for somebody who's, who would tell the truth. RAFSHOON: The truth became a very important thing to tell. And one of the things that we had with Carter, whether you like it or not, he always wanted to tell the truth. MATTHEWS: I know he did. RAFSHOON: And when, and when you start talking about the problems that a president faces, he owns those problems. MATTHEWS: Rick what do you think about Obama coming in after, a sophisticated Obama coming in after a different kind of, an incurious president like Bush? HERTZBERG: -and we're, we're, we're, that's the kind of president we got now. MATTHEWS: Well if you like reading Rick Hertzberg, read the New Yorker every week. He's up there in Talk of the Town and elsewhere in the magazine. Rick Hertzberg, my former boss at the White House, former chief speechwriter. And Gerry Rafshoon who almost personally brought Jimmy Carter to the White House.